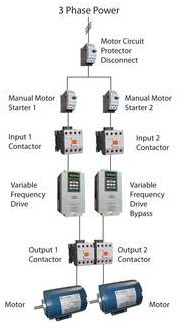 Franklin Control Systems - News - VFD bypasses and backups: Which should you use? A traditional bypass consists of a separate motor starter, mechanically interlocked with its companion VFD output contactor in a way that allows only the VFD or the bypass to operate the motor at any given time. Most traditional bypasses default to “manual” operation to engage the bypass. In other words, someone must manually turn on the bypass in the event that the VFD fails. A VFD fault relay can be used to start the bypass automatically based on a VFD fault, but only if the VFD is not damaged. Traditional bypasses are also available in 2- or 3-contactor variations. A 3-contactor bypass (Figure 1) introduces an additional contactor or a VFD isolation switch that disconnects the VFD from power supply. This enables an electrician to completely remove the VFD while the application is running in bypass mode. However, this is not recommended as it sets up the electrician to work in close proximity to high-voltage wiring. A 2-contactor bypass is sufficient for most applications requiring a bypass and does not provide a complete VFD isolation. Also keep in mind that local codes may restrict the actual configuration. The traditional bypass is readily available. Other advantages are that it is inexpensive in comparison to other backups, allows for building automation system (BAS) control, and is extremely reliable. On the downside, a traditional bypass offers no advanced motor protection, needs relays for automatic control, and has no soft start capability. Communication to BAS is limited, communicating status/fault only. All energy savings is lost and consumption is not monitored in bypass mode. Finally, the traditional bypass offers 60Hz operation only. The electronic bypass was recently introduced to address a number of concerns with built-in logic and advanced motor protection. This microprocessor-based bypass (Figure 2) offers advanced features such as protection from phase loss, ground fault, over/undervoltage, and over/under power. These protection features go far beyond what a traditional thermal overload provides. Electronic bypasses also typically include a provision for BAS to communicate directly to the bypass in the event of VFD failure. This should be coordinated with BAS software manufacturer. The electronic bypass allows users to select certain conditions in which they want the bypass to start automatically, and incorporates other features that traditionally would only be supported by the VFD (fault logging, delays, etc.). There are also electronic bypasses on the market that integrate full ANSI grade power metering, and BACnet or other communications interfaces to allow for seamless control and communications whether in VFD or bypass mode. When using a value engineering approach, considerations must be made to select the proper backup for various HVAC applications. From a purely economic standpoint, this means in many cases the designer/specifier should aim to limit the amount of downtime rather than eliminate it completely for noncritical applications. In other words, the proper backup for some applications may be no backup at all. A VFD with a disconnect makes sense for noncritical applications as long as steps are taken to ensure downtime is limited in the event of a failure. One approach would be to purchase a spare VFD in each frame size to keep on hand. This could easily be done with the funds saved from eliminating the bypass on all noncritical applications. Those savings can also be passed on to cover the cost of redundant VFDs for critical applications. If yes, specify redundant VFDs. If no, move to Question 2. 2. Is this noncritical application tied to fire alarm for smoke control? If yes, specify smart bypass (or traditional with provision for fireman’s override). If no, specify VFD with disconnect only. Bypass should not be used in some situations. For example, do not use bypass on supply fans. Doing so doesn’t make sense for system control, and doesn’t make sense economically. If the VFD is flipped to bypass, damage can be caused due to overpressurization of ductwork. This is especially true for variable air volume systems. If balanced at 50Hz, for example, major damage can occur if the VFD is bypassed at 60Hz. If a bypass must be used, provisions should be in place to prevent damage in the bypass mode. Controls should ensure in-line dampers are fully open, and a high pressure limit switch should be added to cut off the VFD before damage occurs. If there is a return exhaust fan, this must be controlled in synchronization with the supply fan. Bypass should not be used on applications running over 60Hz. Many of today’s air handlers are running over 60Hz. Switching to bypass on these systems will limit them to 60 Hz, which won’t necessarily cause damage, but underpressurization and poor performance may occur. In these instances a better option would be a redundant VFD system. It’s possible to use redundant VFDs sized for multiple loads on fan-array-type applications. This way, full control is maintained if the primary VFD fails. In this type of installation each motor must be individually protected by a separate overload, and the VFD overload must be disabled. Choosing among the many options for backups, bypasses, and motor drive packages can be confusing. To ease the selection process, remember to first carefully consider the advantages and disadvantages of each.